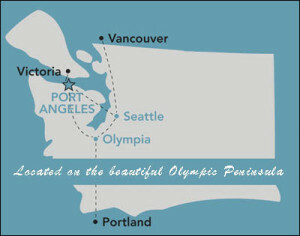 The North Olympic Discovery Marathon is located on the Olympic Peninsula in Washington State. Port Angeles is nestled between the Strait of Juan de Fuca and the Olympic Mountains. Port Angeles is approximately a 2.5 hour drive from Tacoma; a 3 hour drive from Olympia; a 2.5 hour drive from Seattle (including ferry ride); and a 4.5 hour drive from Portland, Oregon. The North Olympic Discovery Marathon and Half Marathon are run on a unique point-to-point course that incorporates the Olympic Discovery Trail with stunning views of the Olympic Mountains and a five mile finishing stretch along the shores of the Strait of Juan de Fuca. The full marathon is a USATF sanctioned event that is a Boston Marathon qualifier. The event will be chip timed. The rails to trails course is a wide, mixed, hard surface trail. Cool June weather next to the ocean can be expected. Both courses are marked at every mile. Note: The parking is very limited at Agnew and we strongly suggest that you park in downtown Port Angeles (PA) (where race finishes) and take the free shuttle to the race start. Travel west through Sequim on Hwy 101 and turn right on Carlsborg Road. Travel about 1.7 miles to Old Olympic Highway and turn left. Travel on Old Olympic for about 2.7 miles. Turn left on Barr Road/Right on Gunn Road. Agnew Soccer Fields are on the SE corner of Barr Rd. and Old Olympic Highway. From Port Angeles travel east on Hwy 101 (5 – 6 miles), turn left on Old Olympic Highway (just past the State Patrol Office). Travel on Old Olympic Hwy for 3 miles. Turn left on Matson Rd., turn right on Finn Hall Rd., turn right on Gunn Rd. Look for parking on Gunn Rd. Agnew Soccer Fields are on the SE corner of Barr Rd. and Old Olympic Highway. Do not park on Old Olympic Highway. Park on Gunn Road and plan for a 5-10 minute walk to the start area. Click here for map. Important: to exit the half marathon area please follow these directions in reverse – do not use the red highlighted section of Old Olympic Hwy. Note: Parking is available in the field just South of Carrie Blake Park. Travel west on Hwy 101 and take the Simdars Rd Exit, merge onto East Washington Ave. Travel about 1 mile to Blake Street and turn right. Travel .5 mile to Carrie Blake Park on right. From Port Angeles travel east on Hwy 101 for 15 miles. Take Sequim Ave exit. Turn left on Sequim Ave. Turn right on Washington. Travel .6 mile to Blake Street and turn left. Carrie Blake Park is .5 mile on right. Parking available in field South of Park. OK, here you go. Larry’s personal strategies for running a fast time on the North Olympic Discovery Marathon. (Remember, this advice is free and worth about the same as it costs, nothing). Half marathoners, obviously pay attention to the second half of the description. You start out on a wide flat road next to Carrie Blake Park in Sequim. Turning east after about 1/4 mile there will be a gradual uphill to the first aid station. At about 2 miles you will be at the high point of the day. Use this section to feel out your legs and establish your race pace. Most of you are experienced enough not to get caught up in the opening race jitters and go out too fast. From here until mile 16 is amazing. The course is a gradual downhill back to the start area. 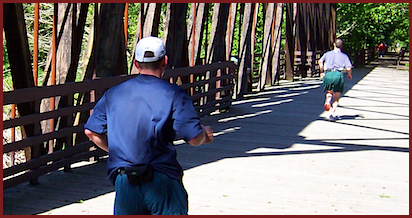 You will run through downtown Sequim and on towards Railroad Bridge Park and the Dungeness River where you cross over a beautiful trestle bridge and onto the Olympic Discovery Trail. Here the trail is flat and wide with great footing. Don’t forget to look around at the river, the mountains and the fields during this section from Sequim to Mile 16. You should be able to cruise this section! Establish a fast pace and enjoy! The only hill is a slight drop and climb at McDonald Creek, a very pretty area just past the 13 mile mark. The Half Marathon will start at the Agnew Soccer Fields this year. Below is a detailed description of the route for you Type A’s. It’s all flat but there is a dogleg with a 180 degree turn after 3/4 mile. Seed yourself accurately for your pace. We didn’t like throwing in a dogleg this early but from an overall course design and safety view it made the most sense to the half start design team. After your start, the first 3 miles are flat and fast. Take my advice and check out this section ahead of time. You start out with a bang! Sieberts Creek. The creek beds here are steep! BUT SHORT. Be aware that these creek beds are coming. Don’t lose your focus and don’t allow yourself to go anaerobic. You just got through a section where you will be able to get ahead of pace. This is where you can back off. Walk the hills out of Seibert (mile 16) and Bagley Creek (mile 20) and rehydrate. This section is rolling, shady and forested. Bears have frequented the course but I wouldn’t be too worried race day. At the Morse Creek overlook you will begin a fast running descent to the Morse Creek Bridge. If this section doesn’t inspire you nothing will. Here you leave the roads. Cross the bridge which is another old RR Trestle over Morse Creek, a real jewel flowing out of the Olympics. There is a < 1/2 mile section of gravel road (footing is still fine) that is fully canopied over with large maple. The trail turns west and runs right along the Strait of Juan de Fuca to the finish (one blip more on that in a minute). This section is newly paved asphalt that reminds me of a track surface. Look for the Jamestown tribal canoes out on the water. We frequently see otters, seals and a wide variety of coastal water fowl. There have been whales (both Orca and Gray) offshore here. Now for the blip: It looks like you are going to cruise right into town. There is an old mill site that the trail has to bypass however. The course takes a <1/2 mile detour away from the water. It’s a bit of a surprise if you aren’t aware that it’s there. The final aid station is immediately across Ennis Creek. You can drive to this parking area to preview the mill site detour. The last mile is flat and fast and is right on the water. You can see and hear the finish! This truly is a great course! There is variety and beauty. To run a full or half marathon is hard, so expect to be tired at the finish. Be prepared for the hilly section and you can set a PR on this course, a lot have been set here. Copyright © 2019 — Run For Joe • All rights reserved.